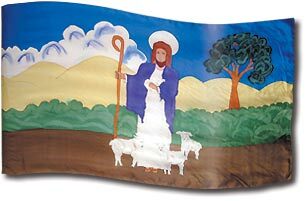 This banner portrays a shepherd in an open field surrounded by his sheep. The "naive" style is reminiscent of children's story books about the Good Shepherd gently watching over His flock, protecting them and leading them to green pastures. He holds a lamb on one arm and in his right hand is a shepherd's staff. The shepherd stands with authority over His flock. He is the focal point of a pastoral scene with the tree, hills and clouds adding symbolism through their colours. Both God the Father and God the Son are portrayed as "The Good Shepherd" and they provide a model for Christian leadership. God is our good shepherd who looks after us, watches over us and ensures all our needs will be met, He is gentle and carries us close to His heart (Psalm 23, Isaiah 40:11, Jeremiah 31:10, Ezekiel 34:12, Revelation 7:17) God is addressed and recognised as the "Shepherd of Israel" (Psalm 80:1, Isaiah 63:11). God alone is the great shepherd (Jeremiah 49:19, 50:44, Zechariah 13:7-9, Hebrews 13:20). Jesus had compassion on the people around him, for they were lost like sheep without a shepherd and provides shepherds for them (Matthew 9:36-38, 1 Peter 2:25) When the time comes, the Good Shepherd will separate the 'sheep' from the 'goats' and bring the 'sheep' into His kingdom (Matthew 25:31-34). Jesus declared to His disciples and followers that He alone was the Good Shepherd, and the only way to heaven (John 10:2-16) Christian leaders are to be good and faithful shepherds of God's sheep and they will be rewarded in eternity (1 Peter 5:2-4). Christ, God's Flock, Second Coming, Sheep, Shepherd, The Good Shepherd, The LORD My Shepherd.